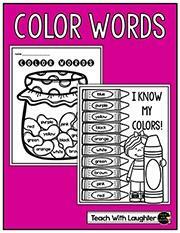 A 'Color Words' Activity—with FREE Download! This is a guest blog post by Laureen, a Canadian first grade teacher of 25 years who writes at the blog Teach with Laughter. This post includes a free download! I first became a Joy Cowley fan when I fell in love with Mrs. Wishy-Washy. The more books I read, the more of a fan I became! The Joy Cowley Early Birds series is perfect for engaging young readers. The books range from Levels C through G and are great for independent and guided reading. In the story Balloons (guided reading level E), the illustrator grabs our attention with an illustration of a balloon and a cat with claws out. Before reading, ask students what they infer might happen in the book. This will spark their curiosity and get them wanting to turn the page! 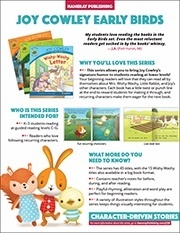 To make your guided reading plans a breeze, the inside back cover gives suggestions of how to use the book before, during, and after reading. It also lists features of text to help you decide if this book is a good choice for your reader. As mentioned in one of my previous blog posts, after I finish with a guided reading group I like to give them a follow-up activity to keep them engaged and to let me focus on my next group. This activity focuses on color words, which gets me thinking, “Why did each family member in the book choose a red balloon?” Download the activity below! To learn more about Joy Cowley Early Birds, visit our website and click the series highlights image below to download an information sheet with key features. To get today's free activity download, click the right image below!